It is so easy to think about how busy I am, that pain in my shoulder, issues with children or family members, disasters around the world. There’s abuse, divorce, homelessness and helplessness. Reading the newspaper and watching the evening news can cause anyone to become worried and depressed. How then can one see beyond the hate and darkness and see the light and beauty around us? Where can we see God, who is beauty, love and all things good? Even in the darkest world, God is here. I was tired of feeling blah, cynical and self-centered. Then I discovered this book that changed the way I view my world. 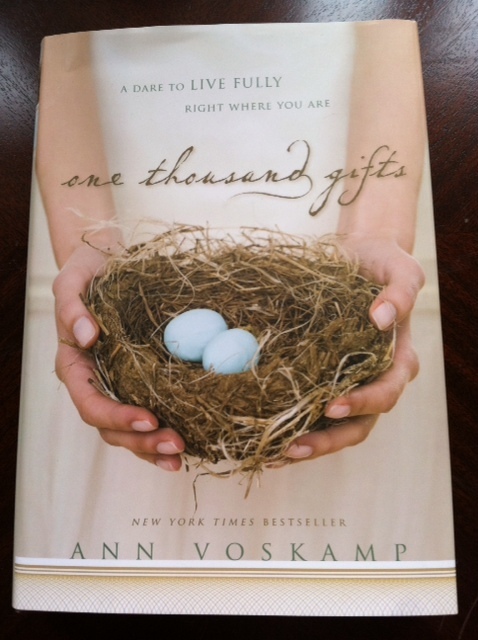 Ann Voscamp experienced tragedy when she was young and she couldn’t quite get through it as an adult. A heavy cloud followed her, until a friend told her to think about those things she was thankful for. 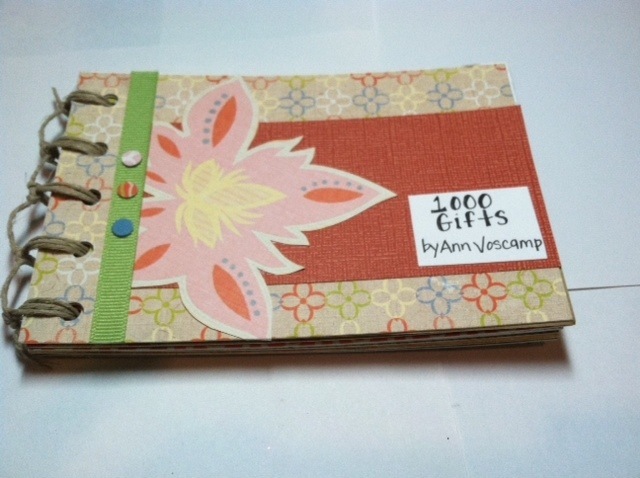 She was challenged to think of 1000 gifts from God. Ann discovered that as she spent more time looking for God in the big and small things in her life, the dark cloud began to disappear and the world became more beautiful. I wanted this challenge. But I have to say that after I wrote down how thankful I am for my health, family, food and home, I was at a loss. Luckily for me…and you, Ann helps us see things differently. On her website www.aholyexperience.com, Ann gives us a daily calendar of prompts. One day may be to name 3 things blue or maybe 3 things broken. As we write these gifts down we are reminded daily of how much we are blessed. The more I concentrate on looking for God, the less I focus on the negative and dark. 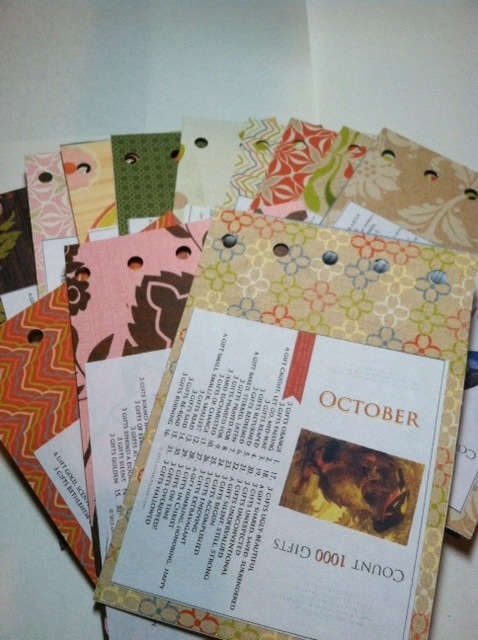 This journaling practice has been so helpful to me, I decided to make some calendars for friends. I first downloaded the monthly pages from A Holy Experience website. 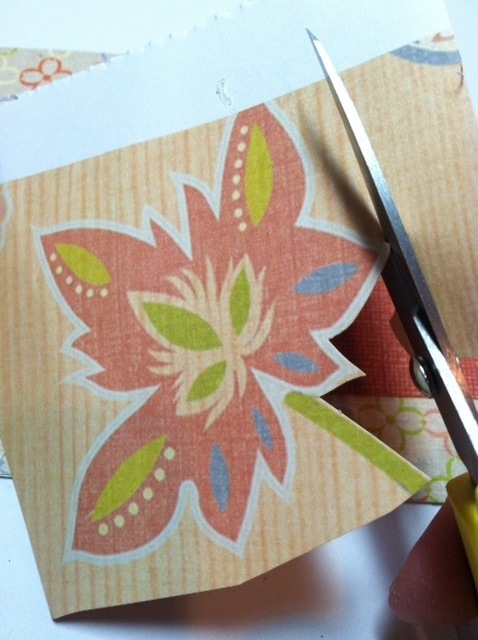 I dug through my paper stash and found lots of pretty paper to glue the months onto. 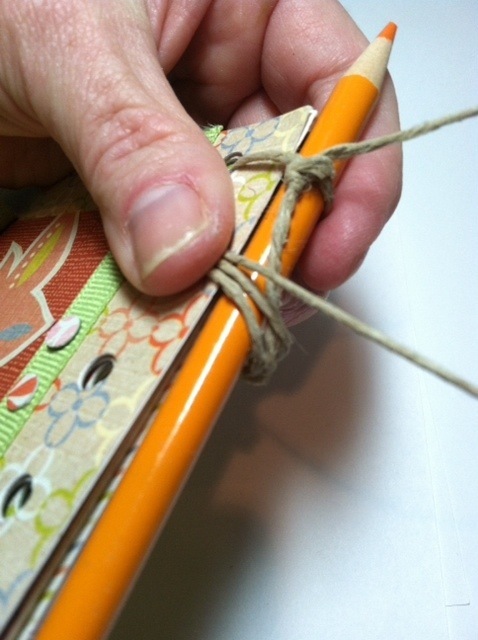 I decorated the front cover with ribbon and cut out designs. Ta Da! 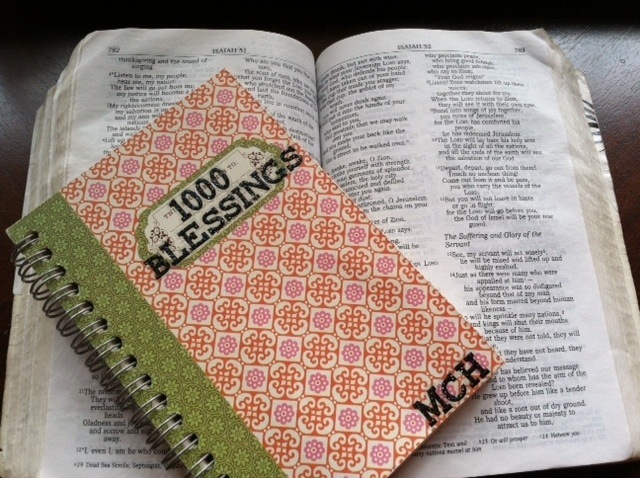 Add a journal to record your blessings and your on your way to a brighter outlook! I promise you will be blessed. Posted on February 22, 2013 by mary •	This entry was posted in Faith and tagged Faith, thankfulness. Bookmark the permalink. Mary, you are the bomb.com!! love you! Thank you Ms Angie! Love you too!